It was once without question the best known ghost story set in Sullivan County, written by one of America’s most respected writers, and yet it is largely unknown today. It combines detailed descriptions of the rich and bountiful beauty of this area in the 19th century with cleverly conceived ghouls as hideous as any in American literature. 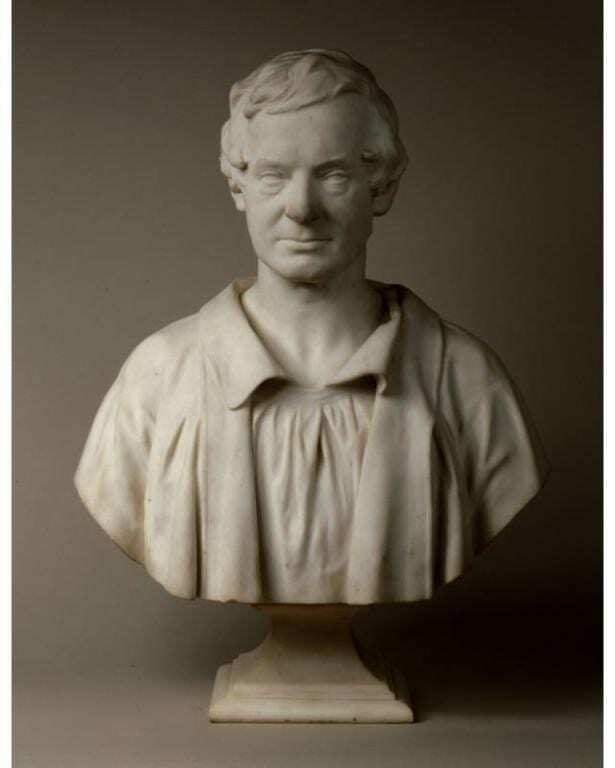 On April 3, 1783 Writer and satirist Washington Irving was born in New York City. He best known for his short stories “The Legend of Sleepy Hollow” and “Rip Van Winkle,” but I will always love him best for coining the name of New York’s basketball team! 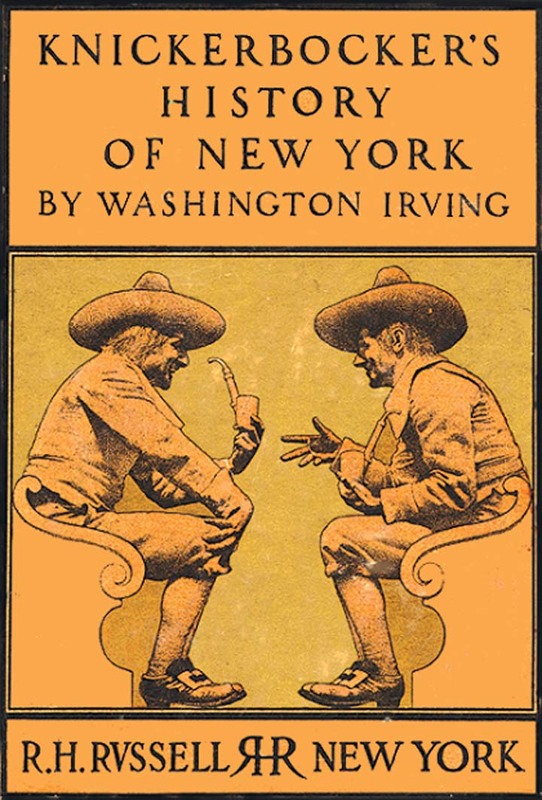 In 1809, Irving published his first major book, A History of New-York from the Beginning of the World to the End of the Dutch Dynasty, by Diedrich Knickerbocker. 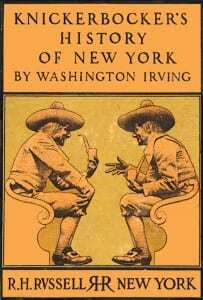 Through the Knickerbocker pseudonym, Irving poked fun at the city’s self-important Dutch elite, in which Knickerbocker was a fairly common last name. He also pulled an elaborate prank in anticipation of the book’s release, posting “missing person” adverts in city newspapers, claiming Knickerbocker, a Dutch historian, had gone missing from his hotel room. 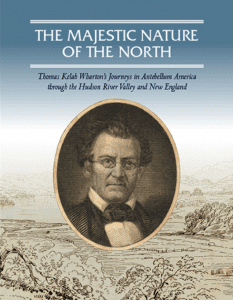 [Read more…] about Happy Birthday Washington Irving! 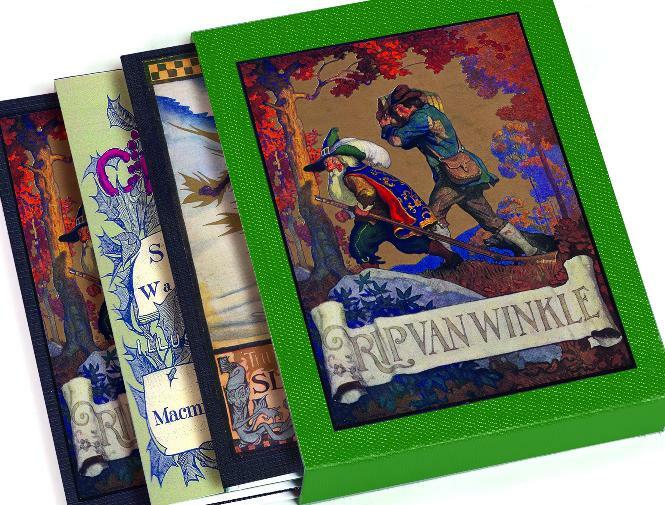 Washington Irving’s The Legend of Sleepy Hollow is one of the best-known works of American literature. But what other myths lie hidden behind the landscape of New York’s Hudson Valley? Imps cause mischief on the Hudson River; a white lady haunts Raven Rock, Major Andre’s ghost seeks redemption and real headless Hessians search for their severed skulls. Local storyteller Jonathan Kruk relates the other myths that lie hidden behind the landscape of the Lower Hudson Valley in Legends and Lore of Sleepy Hollow and the Hudson Valley (History Press, 2011). Kurk reveals the origins of the Washington Irving’s Headless Horseman and how the Legend of Sleepy Hollow was shaped and shifted by Henry Hudson, George Washington, Aaron Burr, Joseph Plumb Martin, Sir Walter Scott, Gottfried August Burger, Martin Van Buren, Walt Disney, Tim Burton, Johnny Depp, and a former slave. 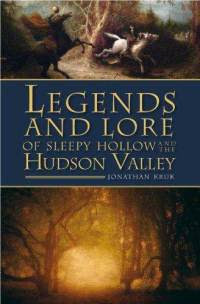 The author also provides new primary source evidence of the ghostly “Galloping Hessian” and similar tales including the full story of Sleepy Hollow’s other ghosts; Major Andre, White Ladies, Mother Hulda, the Imps, and more. A Communipaw Story Marathon will be presented tomorrow, Friday, June 4, as part of Jersey City’s quarterly arts and culture festival, JC Fridays. There will be dramatic readings by professional actors of several short stories by Washington Irving, including three set in Communipaw, from his 1855 collection, Wolfert’s Roost And Miscellanies. Communipaw is the historic European place of origin for Jersey City begun in 1634 when one of the first “bouweries”, or farnmsteads, in New Netherland was built there. The homestead was part of Pavonia, a patroonship of Amsterdam businessman Micheal Pauw. Plantations, worked by enslaved Africans, were located there. The Tappan and Wecquaesgeek took refuge there in 1643 before being attacked by the Dutch in the Pavonia Massacre, which led in part to Kieft’s War. The village of Communipaw was originally part of the Dutch West India Company holdings. 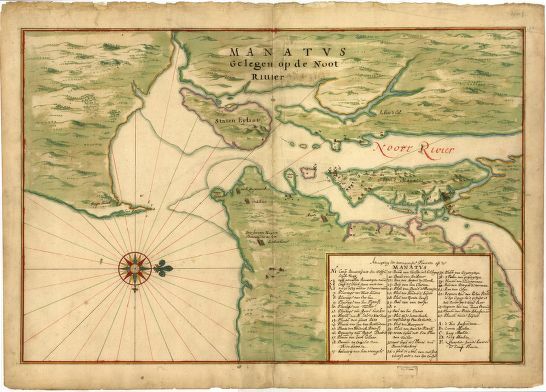 After the British takeover it became part of the Province of New Jersey although it retained its Dutch character for hundreds of years. 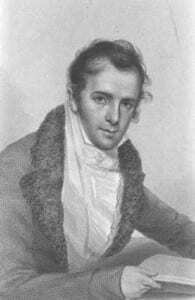 Washington Irving visited the area often and referred to Communipaw as the stronghold of traditional Dutch culture. Illustration: Joan Vinckeboons (Johannes Vingboon), “Manatvs gelegen op de Noot [sic] Riuier”, 1639. “Manhattan situated on the North Rivier” with numbered key showing settlements at Communipaw. In a unique collaboration, the New York Council for the Humanities has joined forces with the Rensselaer County Historical Society to offer Reading Between the Lines: Travel and Tourism Narratives of the Empire State, a monthly reading and discussion series that runs from March through June, 2010. “Reading Between the Lines offers an unusual twist on the standard book group format with focused thematic discussions led by humanities scholars,” says Council Executive Director Sara Ogger. At the Rensselaer County Historical Society, the discussion leader will be Shealeen Meaney, Assistant Professor of English at Russell Sage College. Meaney will lead four discussion sessions each focused on a book related to the series theme: Legend of Sleepy Hollow & Other Tales, by Washington Irving; The Artificial River: The Erie Canal and the Paradox of Progress, 1817-1862, by Carol Sherrif; The Second Greatest Disappointment: Honeymooning and Tourism at Niagara Falls, by Karen Dubinsky and Taxi! 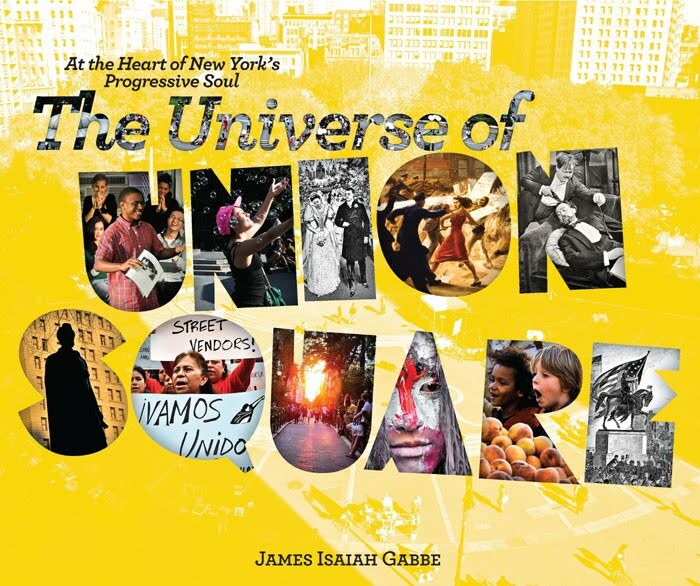 A Social History of the New York City Cabdriver, by Graham Russell Gao Hodges. Participants in the series read works of non-fiction and works of literature that are discussed within an historical context. The program is free and open to the public, although pre-registration is required. The group will meet on the third Thursday of the month – March 18, April 15, May 20, and June 17 from 7-8:30pm at the Rensselaer County Historical Society, 57 Second Street, Troy, NY. For more information on the program, visit http://www.rchsonline.org/programs.htm#RBTL or contact Mari Shopsis at 518-272-7232, x 17 or at mshopsis@rchsonline.org. Reading Between the Lines is designed to promote lively, informed conversation about humanities themes and strengthen the relationship between humanities institutions and the public. Reading Between the Lines series are currently being held in communities across New York State. The project is supported by the We The People initiative of the National Endowment for the Humanities. For more information about Reading Between the Lines: Travel and Tourism Narratives of the Empire State, visit www.nyhumanities.org/discussion_groups. A Multidisciplinary Conference on the era of the War of 1812, co-sponsored by The Omohundro Institute of Early American History and Culture, The Huntington Library, the New York University Department of History, and The John W. Kluge Center at the Library of Congress will be held March 31 – April 1, 2011, at the Library of Congress, Washington, D.C. The War of 1812, the first declared war in the history of the United States, erupted in the midst of countervailing forces shaping America in the first decades of the nineteenth century. From the Louisiana Purchase of 1803 to the Seminole War of 1818; from the close of the Atlantic slave trade in 1807 to the founding of the American Colonization Society in 1817; from the resumption of the Napoleonic Wars in 1803 to the second Barbary War in 1815; from New Jerseys revocation of female suffrage in 1807 to Frances Wright’s arrival in America in 1818; from the publication of Tabitha Gilman Tenneys parodic sentimental novel Female Quixotism (1801) to Washington Irving’s Sketch-Book (1819); from Charles Willson Peales The Exhumation of the Mastodon (1806) to Charles Bird Kings portrait of Secretary of War John C. Calhoun (1818), this understudied era was crowded with events destined to unsettle the so-called revolutionary settlement. At once postcolonial and neoimperial, the America of 1812 was still in need of definition. The decision to go to war catalyzed a critical era, one too often dismissed as an insignificant interregnum between the world of Jefferson and the world of Jackson. In contrast to the progressive experimentation of the 1780s and 1790s, the years surrounding the War of 1812 can be characterized as a period of narrowing possibilities and sharpening distinctions. Yet, the volatile elements that converged in the war and that emerged, transformed, point to the generative instabilities of the early Republic. This pivotal period merits further scholarly consideration. The conferences title, Warring for America, 1803-1818, seeks to uncouple the War of 1812 from its stale fixture as the finale of the revolutionary era. Henry Adams contended that many nations have gone to war in pure gayety of heart; but perhaps the United States were first to force themselves into a war they dreaded, in the hope that the war itself might create the spirit they lacked. Historians have largely followed Adamss lead, interpreting the War of 1812 as a second War for Independence, a crisis meant to create the spirit of American nationalism. This conference, conversely, will consider the war as a volitional conflict that resulted from a confluence of many social, cultural, and geopolitical pressures and that had divergent consequences for the future of the extended republic. Scholars are invited from a wide spectrum of disciplines from history and literature to art history and material culture to consider from new perspectives the struggles among Indians, Britons, Canadians, Euro-Americans, and African Americans throughout the North American continent, the Caribbean, and across the Atlantic Ocean. At issue were conflicting visions for control over territory, meanings of liberty, and distributions of power that came into focus through the upheaval of war. Proposals should address the connections between the new republics underlying tensions and the promulgation, execution, and explanations of the war itself. The organizers encourage submission of proposals for new, original work that is not committed for publication elsewhere, as a volume of essays resulting from the conference is anticipated. Submit a one- to two-page synopsis of your paper proposal and a short-form c.v. no later than January 15, 2010. Submissions must be done electronically, either online at the conference Web site, http://oieahc.wm.edu/conferences/1812/cfp/index.cfm, or by email to the Omohundro Institutes webmaster, Kim Foley, at kawahl@wm.edu. Include on the c.v. complete contact information (mail, email, and telephone). All submissions will be acknowledged by email. If you do not receive an acknowledgment, please resubmit or contact Kim Foley. Program Committee: Fredrika J. Teute, Omohundro Institute; Nicole Eustace, New York University; Rob Parkinson, Shepherd University; Carolyn Brown, Library of Congress.